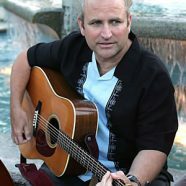 Chris Stuart is a songwriter, bandleader, journalist and first-prize winner of the prestigious Chris Austin songwriting contest in bluegrass and gospel at Merlefest. 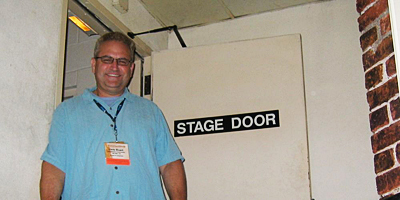 Here’s a recent picture of Chris at the backdoor of the Ryman Auditorium in Nashville (he wrote the script for this year’s IBMA Awards Show and got to hang out at the famous venue). Chris, congratulations on being named “Print Media Person of the Year” for 2008 by the International Bluegrass Music Association (IBMA) for your work as a freelance writer for Bluegrass Unlimited magazine. Awesome! How did you become interested in this type of writing and what’s your favorite part about writing for music magazines? I started writing for Bluegrass Now back in the mid-90s with a songwriters series where I interviewed songwriters. From there, I did a few pieces for Bluegrass Unlimited, but didn’t really start writing a lot for them until about three years ago. It’s still more of a fanzine approach than hard journalism, but we’re trying to promote the music and find out what’s unique about each artist. I enjoy interviewing the artists and piecing it all together. There’s a challenge in making each article different. You’re one of my favorite songwriters, and it’s great to see artists like Claire Lynch, Larry Cordle, Dan Paisley, Suzanne Thomas, Dale Ann Bradley and Sally Jones recording your original songs. When you’re writing new material, when do you start thinking about who you would like to hear performing the song? I’ve only done that twice. Oddly enough, the first song I wrote, Paul and Peter Walked, I wrote with the voice of Alan O’Bryant in mind. When Claire Lynch recorded it, Alan sang harmony with her and I heard them sing it together at the IBMA awards show, so it kind of came true. The only other time I’ve had a voice in mind when I wrote a song was one on our latest album, a song called “I Remember Memphis” which I heard the voice of Jimmy Martin singing it while I wrote it. Of course, no expectations that Jimmy’s going to record it since he’s moved on to greener pastures. I just wanted to try writing a “Jimmy Martin” type song. I sent Doyle Lawson a gospel song recently that I heard his voice on and he’s recorded it for his next album, so sometimes you can imagine certain people doing certain songs after the fact and it works out, but that’s rare. As a thoughtful and engaged songwriting instructor (I know because I’ve listened to you firsthand), what are some of the key thoughts you want folks to remember at the end of a songwriting workshop? Most of the questions you get at songwriting workshops boil down to the essential question of “How do I get started?” Even the question of “Which comes first, words or lyrics?” is just asking how it all starts. I try to tell people that if they have an idea already, then they need to sit down and work on it. There’s no getting around it. You have to work through a song. If you’re looking for an idea, I try to get people to imagine themselves in a situation, so I’ll make up a scenario I call the “Cellar Stairs Exercise” where I describe how they walk down a dark flight of stairs into a cellar and I describe various smells and feels and sounds and then I ask them to write the first line of a song. At least it gives people a starting point. I’ve also done exercises in workshops where I ask people to write stream-of-consciousness for three minutes and then read what they’ve written. It’s all part of getting started on writing a song, of moving into that subconscious where the songs exist and where you have to pull them kicking and screaming, sometimes, out of. . .
Where are you finding inspiration for your own songwriting these days? I read a lot of history and I also listen to old songs and try to find ines that spark an idea or a new way of thinking of things. I also sometimes take the titles of novels and see if they might make a good song title. Mostly, I just try to listen to whatever’s going on around me… bits of dialogue, sounds, etc. I noticed earlier this month when Obama gave his victory speech that his voice modulated between two notes when he was talking about his daughters, Sasha and Malia. I tried to figure out what interval that was and I’ll probably use it in a song sometime. When I wrote “Shenadoah Wind” (which Bobby Osborne just recorded for his new album in January 2009) I used the interval that’s in the old song “Sheandoah” and incorporated it into my song. I just always have all these little bits and scraps of things in my head that I carry around and that sometimes come out in songs. The 2008 schedule for Chris Stuart & Backcountry has taken you to venues all over the US and Canada. What is your favorite type of venue for presenting your original music? That’s a great question. Strangely enough, I like small venues like house concerts the best. Not too small, of course! But we’ve played a few large events and it just feels too big for me. I’m not that kind of entertainer. I like to tell stories between the songs and engage the audience (sometimes the band members do get tired of hearing the same jokes and stories), so a smaller crowd is better for me. What’s the most valuable thing you’ve learned over the years about songwriting that might be helpful to others following the songwriter’s path? I once heard Alan Munde say about banjos that, “It’s just a banjo.” I feel the same way about songs. They’re important and they can move people to tears and laughter and dance, but in the end, it’s just a song and you shouldn’t beat yourself up too much about them. Write a song and move on to the next one. Be critical of your writing, but not to the point of not finishing the song. Also, keep your publishing!